Sandplay therapy stems from the work of British physician Margaret Lowenfeld (1939). The theoretical foundation is based on the Jungian concept that the psyche has an autonomous disposition to heal itself and to grow towards fullness (Jung 1960/1981). The sandplay method consists of the client creating a three dimensional picture with miniature figures in a tray of sand. 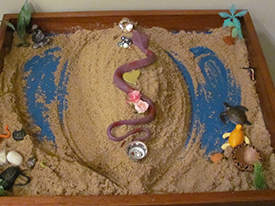 Sandplay therapy is used for both adults and children. The safety of the therapeutic relationship created between the therapist and the client, enables the client during sandplay to go beyond the limits of the conscious mind, to stimulate psychic development and to access channels to fuller, more creative living, and to become more of who you have the potential to be.